The Gretsch G5420T Electromatic Hollow Body Bigsby Candy Apple Red delivers the classic, wide and dynamic Gretsch sound. While two Blacktop Filter'Tron humbuckers provide sufficient punch and clarity, the Hollow Body construction with Parallel Tone Bars contributes a certain acoustic timbre. Robust vintage style open-back tuners, a pinned Adjusto-Matic bridge and an original Bigsby B60 vibrato tailpiece complete the Gretsch G5420T. 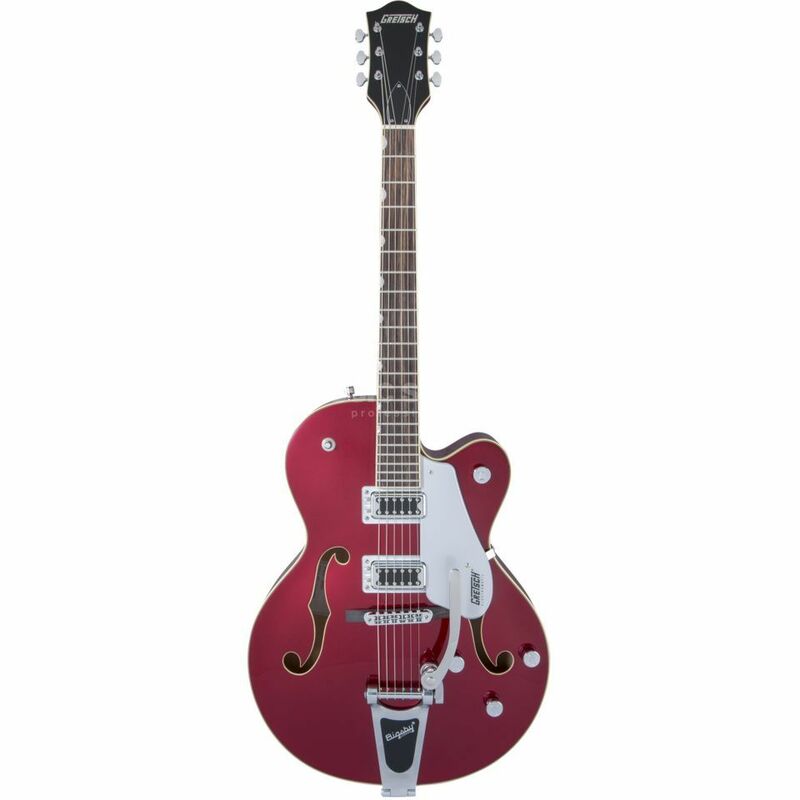 The Gretsch G5420T Electromatic Hollow Body delivers the typical Gretsch sound. The powerful hollow body of the Gretsch G5420T Electromatic is made of traditional maple laminate, with the Parallel Tone Bars bracing stabilizing the top. Accordingly, the electric guitar has a distinctive basic tone with an airy acoustic timbre. With the "Standard U" profile, the glued maple neck also lies comfortably in the hand, ensuring comfortable playability across all layers of the rosewood fingerboard. The Gretsch G5420T uses two Gretsch Blacktop Filter'Tron humbuckers as pickups, whose origin lies in the ingenious pickups of the creative inventor Ray Butts. Accordingly, the Gretsch Electromatic Hollow Body delivers a clear sound with rich punch on the amplifier, which captures the acoustic timbre with lively dynamics and thus allows expressive electric guitar playing between County, Blues and Rock'n'Roll. The pickups are managed by the traditional Gretsch circuit, which provides a 3-way switch, individual volume controls for each pickup, a general Tone fader and a Master Volume control. The tailpiece of the Gretsch G5420T is an original Bigsby B60 Vibrato Tailpiece, which invites you to decorate melodies or chords with gently shimmering modulations. From here, the strings are led over the Gretsch Adjusto-Matic bridge with rosewood foot, which is fixed in intonation-proof, before they are held after 25.5" scale length (648 mm) on the vintage style open-back tuners of the headstock.